Giorgio Armani once said, "Elegance is not standing out, but being remembered”. And what lady wouldn’t want to be remembered? A beautiful watch is one way for a lady to set herself apart, for her to be remembered. Thankfully, there are as many different watch styles and designs as there are different types and personalities of women. At Anytime, we carry hundreds of different ladies’ watches. 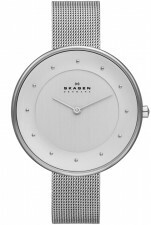 Our unique collection of watches for ladies includes those designed by famous brands such as Skagen, Daniel Wellington, Calvin Klein, Certina, Tissot and others. Anytime’s range is hugely diverse, so we know that we offer a watch for every occasion. Our large collection of watches for women may make the selection process tricky! Therefore, we recommend that you use the filter function to the left to narrow the search for your ease. Enjoy!